Caption reads: BATHING in Iveson home (no bathroom and only one water tap-cold, in kitchen) calls for tin tub and bucket of water heated on gas stove or coal range (which aided by small pot-bellied stove upstairs must heat the house, there being no furnace. 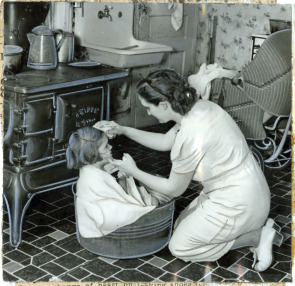 Joan, 5 (goes to kindergarten, had to have tonsils out), huddled in the tub on a recent chilly morning, close to the range, while ablutions are carried on under draft breaking towel. Only alternative is to get shower (cost, one cent) at nearby settlement house and run home fast to avoid possible pneumonia on wintry days.